Under certain circumstances common household products can combust – or catch fire – without any outside flame or spark. One of these products is linseed oil, which many people use to stain their wood furniture, fences or decks. It is a natural product extracted from flaxseed. 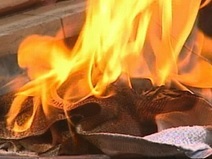 Liquid linseed oil in the can is no more hazardous than any other oil, but leftover linseed oil on rags, paper towels or clothes has the unique ability to generate heat as it dries – sometimes getting so hot that it bursts into flames.